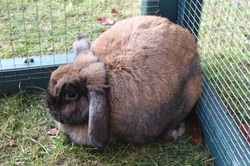 Mocha is a 4 year old dwarf lop. She originally came to the rescue centre as a stray in 2008. She was re-homed but then when her partner died she came back to us in September 2011. She has had to go on a diet and can be a bit possessive over her food but she is very placid when handled. She’s now looking for a new home with a new boyfriend .